This time you mean it. 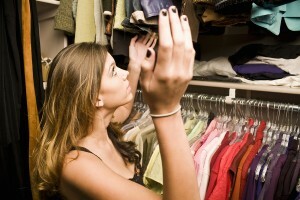 You’re going to organize your closet properly once and for all. No more pushing and pulling through hanging clothes to find something to wear. No more arranging and re-arranging rows of shoes to make space that never seems adequate. The challenge is: Where do you begin? Look at the clothes and shoes in your closet. Is there anything you no longer wear – whether because it no longer fits, is smelly, stained, or out of style? Be honest with yourself. Sort items into three piles – keep, toss, and maybe. Clean the items in the keep pile if necessary and return them to your closet, neat and organized. Leave spaces between items if you can. Put the toss pile into different boxes – items you want to donate, items you want to give to family or friends, items for a yard sale. Put the maybe pile into a box, or however many boxes you need. Label the boxes and store them somewhere other than your closet. If in six months you haven’t used any of these boxed items, then you should get rid of them. Keep your floor as clear as possible for easy cleaning and a more uncluttered look. Also, if you store items in a container, use a clear one and label it. This just makes it simpler to find things when you need them. You can also turn to the home improvement pros at 31-W Insulation. We offer closet organizer systems from ClosetMaid that can help you keep your space orderly and tidy. You’ll have a choice of wire, laminate, and wood storage systems that you configure in different ways to suit how you use your closet. Contact 31-W Insulation today to learn more.